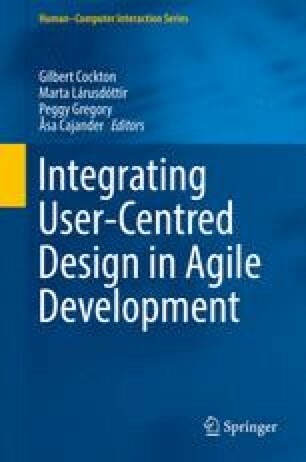 This paper presents two case studies that suggest how to adapt Scrum for user-centered design (UCD) focused industrial projects and how to work with UCD in Scrum software development teams. The objective of the paper is to share insights gained from running such combined projects in industry in order to help others avoid some of the pitfalls associated with this way of working. There has been much published in this area within the research community. However, our work presents both perspectives: adapting a UCD way of working towards a Scrum way of working; and adapting Scrum for running projects from a UCD perspective. We explore the impact Scrum had on team members’ work-practices during a project life-cycle and what lessons were learned from our experiences. The authors would like to thank the team members who participated in the project for their valuable insights and feedback.